L’OCCITANE Malaysia continues to light a flame of hope for the less fortunate ones, having successfully raised a total of RM40,000 from its signature charity fundraising project and also proud to have another 5,000 euro (RM21,285) co-funded by L’OCCITAN FOUNDATION France. L’OCCITANE kick-started its charity fundraising on 9th October last year in conjunction with International World Sight Day, where limited edition I Care About Sight Tote Bag were sold at all L’OCCITANE Boutiques for RM20 each. RM20,000 has been channelled to upgrade MAB’s Orientation and Mobility Classroom in its Kinta Valley Centre, Ipoh, with a Braille globe, Braille maps, Braille tiles and tactile stone path. 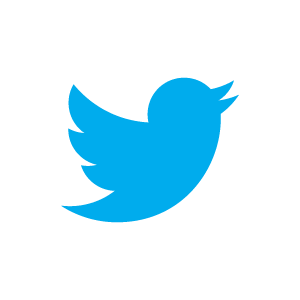 Other proposed mobility equipment include white canes, normal canes and a voice-activated cane, so that the blind and visually-impaired will have the opportunity to expose themselves to more knowledge and practical skills. 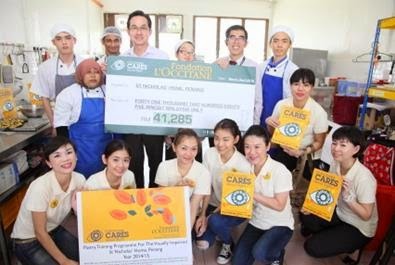 Another portion of the funds – RM20,000 and co-fund of RM21,285 was used to support Pastry Training Programme at St Nicholas’ Home, which allows blind and visually-impaired trainees obtain proper training in baking skills, allowing them to polish their interpersonal skills and pursue careers in the field of baking. 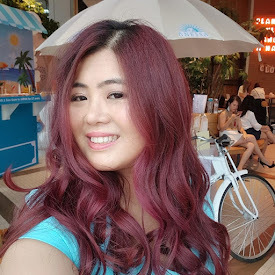 “L’OCCITANE Malaysia initiated its local CSR effort six years ago to offer an equal learning opportunity for both blind and partially sighted children and adults to acquire knowledge. 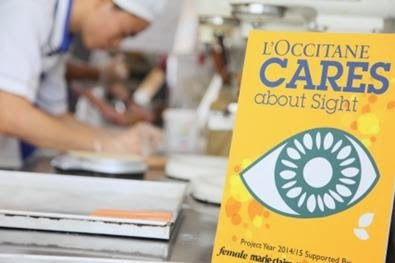 “The newly introduced Pastry Training Program will definitely help to provide a greater and better learning ground to the visually impaired people to enhance their capability at work and thus they are able to live independently and also contribute to the society”, said Mr. Tan Seong Teck, GM of L’OCCITANE. “This is the second time we are extending our supports to St Nicholas Home, Penang. By helping to create awareness and raise funds on behalf of the visually-impaired, we’re able to provide them with more opportunities to improve their lives. We hope to continue this noble effort in a sustainable manner” commented Ms Clarance Boo, PR Manager of L’OCCITANE during her recent visit to St Nicholas’ Home, Penang.